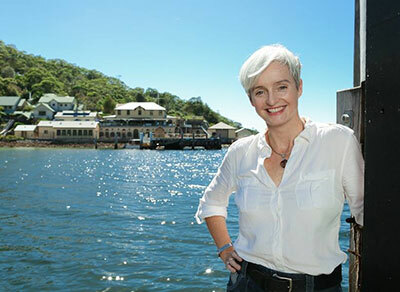 Newly appointed UNSW Science Dean and marine ecologist Professor Emma Johnson spoke at the World Changing Ideas Summit. BBC Future presented its first World Changing Ideas Summit in Sydney on 15 November to a full house, bringing high profile British radio and TV presenters together with international and local scientific experts for a full day gathering in Darling Harbour. Among high profile speakers were BBC broadcaster and author Michael Mosley, former NASA astronaut Ron Garan and UNSW academics Professor Veena Sahajwalla, newly appointed Science Dean Professor Emma Johnson and Black Dog CEO Professor Helen Christenson. Speaking about space history, former NASA astronaut Ron Garan spoke to a series of remarkable images including the first images of the Earth from space. Against the context of complex problems facing the planet today in terms of environmental issues, poverty and conflict, Garan is on a mission to encourage citizens of the Earth to plan for one shared future. He advocated for the human family to unite as one people on one planet and decsrived how he left NASA to work in the area of sustainable development, arguing that poverty is symptom of not seeing ourselves as planetary beings. For Garan, Earth is an iridescent biosphere teaming with life. He looks to the accomplishment of 15 nations coming together to build the International Space Station as an inspiring model for how World leaders could set aside their differences to collaborate on solving global issues. Professor Emma Johnson addressed the Forum’s sustainability theme by talking about how we are loving the sea to death. Amidst global warming issues, particularly sea rise, we are intent on building in on and around the sea. Industrial impacts affecting those cities around the world built on the seashore are immense, and Johnson gave many examples of what structures like oil rigs and off shore wind turbines being established on the ocean and artificial islands and archipeligos are doing to the ocean. From displacing millions of cubic feet of sand dredged from the seafloor and the destruction of mangroves and inter tidal environments to allowing exotic species to create unintended new habitats on pontoons and sea walls, our exploitation of marine environments is having detrimental impacrs across the globe. Johnson describes some of the innovative solutions underway to rebuild local biodiversity and ecological environments. In particular she gave examples of green engineering that uses simple measures like building artificial structures to introduce sea vegetation into harbours. Other innovative methods being used to redress some of the ecological damage caused by building structures in and around the ocean include putting pot plants into sea walls to grow algae, using 3D printing to mimic rock formations and the creation on artificial reefs. Professor Veena Sahajwalla later described research underway at UNSW’s Centre for Sustainable Materials Research and Technology to understand the properties of carbon-bearing materials including graphites, plastics and rubber tyres. A significant area of investigation for Sahajwalla is the emerging field of waste plastics and the creation of environmentally friendly technology for recycling rubber tyres in steelmaking. Sahajwalla decribed processes for extracting valuable resources from discarded electronic devices including Copper, Gold, magnets, base metals and precious elements. She spoke about the creation of ‘microfactories’ to transform recycling and create smart solutions to waste, for example by providing local facilities to extract and create new materials from wasted electronic devices. De-centralised and distributed microrecycling centres have the potential to create new markets for industry at a small scale. Indeed, the creation of small scale microfactories across the world could create local economies and local jobs through extracting valuable commodities from e-waste. Kevin Corti from Uber who described how cutting edge data analytics are being used to improve road safety through tracking vehicle movement and driver behaviour via smartphone sensors. A session recorded for the BBC looked at how we are going to interact with robots, incorporate new technology into our bodies and overcome the barriers to integrating Artificial Intelligence into daily life. In terms of how technology can help older people, a session talked about customised programs that can develop insights into health and wellbeing from sensors. A case study looked at how algorithms map out what is normal behaviour for older people living alone in Italy so that changes in daily patterns of living can signal health risks such as falls or illness. Professor Helen Christensen from the Black Dog Institute explained why online behaviour modification and Cognitive Behaviour Therapy programs are proving to be effective interventions for young adults. Inspiring Australia was a presenting partner of the BBC World Changing Ideas Summit. Find out more about some of the themes explored on the day here.